For demanding jobs, the Oki C9655hdtn A3 colour LED laser printer is a better choice compared to its predecessors because it comes with higher paper capacity. The Oki C9655hdtn printer with a high capacity feeder also has features such as Ethernet, two-sided printing, and an integrated hard disk drive carried over from some of its siblings. Do not expect this feature-packed yet somewhat noisy unit to come cheap. The Oki C9655hdtn colour LED printer boasts a significantly taller build (873mm), though it maintains the same width and diameter as its predecessors. However, the Oki C9655hdtn colour laser printer with hard disk and high capacity feeder is significantly heavier at 133Kg. It has an 800MHz processor and standard 512MB RAM. Colour toners for the Oki C9655hdtn can print approximately 22,000 pages each and must be installed as separate cartridges. It comes with a high capacity paper feeder with wide-format input, which is versatile enough to handle A6 to A3-sized media. Users have the option to integrate additional paper trays into the Oki C9655hdtn colour laser LED printer with high capacity feeder to increase paper capacity to 2,880 sheets. High-resolution printing in 1200x600dpi ensures sharp and very legible text documents. Users can increase their productivity and save resources with the automatic two-sided printing function of the Oki C-9655hdtn laser printer. Up to 20 users can share this printer when the RAM is increased to 1,024MB. The warranty can be extended by up to three years. 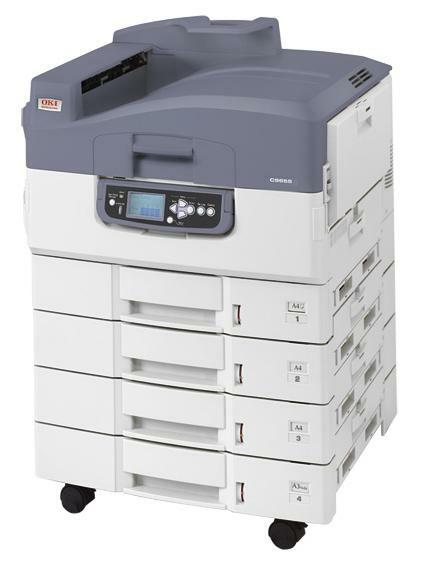 The Oki C9655hdtn printer is expensive and it can be pricier when the RAM and paper capacity are to be upgraded. The device is larger and heavier than its predecessors, so it may require more installation space and at least two people to transport it. Some users may not require the 40GB hard disk drive for their printing needs, so they might overspend for the Oki C9655hdtn when there are less expensive options from the competition. Print quality is mediocre for colour text and graphics.